This morning, at 12:18 a.m., the Pad Leader launched his final mission: Dad passed away peacefully, with my sister Dickie, Wendy and myself at his side. Dad had a good run, and was extremely fortunate to be in the right place at right time to make and be part of history. Although we will miss him, he leaves behind a grand legacy, due in no small part to many, many wonderful friends. Some of those friends are no doubt reminiscing with, and listening to, Dad talk about what incredible experiences they all shared. We could all be so lucky... Godspeed, Dad! Guenter Wendt, the original pad leader for NASA's manned space program who was the last man the Apollo astronauts saw before launching to the moon, died at his home in Merritt Island, Fla., early Monday morning after being hospitalized for congestive heart failure and then suffering a stroke. He was 86. 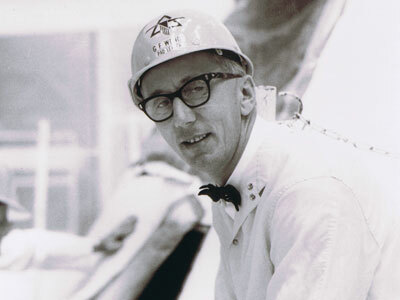 Reporting to Cape Canaveral as a McDonnell Aircraft Corp engineer working on missile projects soon after gaining his American citizenship in 1955, Wendt, who was born and educated in Berlin, became part of the effort to launch the first U.S. astronauts into space. A moment of silence can be signified by a reply with no words and only a period. I am so sad to hear this news. My wife and I thought the world of Guenter. I am truly saddened to hear this. What a shock! I was only sitting right next to him two weeks ago on the bus tour for the ASF Apollo 13 40th dinner. A huge, huge loss. I only got to meet him once - I had breakfast with him at the ASF show in November. What a huge blow to lose this key man in NASA's history. I hope there's good fishing for you in Heaven, Guenter! I am never prepared to read these notices. You taught us well, Guenter, to do our jobs carefully and with cheer. Your legacy shall endure. Personally, words fail me at the moment to convey the warmth and friendship that Guenter shared each time we would see each other. I had the honor of working on a simple website to accompany the release of his autobiography and ever since then, without fail, Guenter would always greet me -- or introduce me to others -- as "the nice fella that designed my great website." I had always wanted to find the time to visit with him and update that site, to grow it into a multimedia archive of his adventures through life and perhaps a blog where he could periodically share his thoughts... an online guide to where Guenter Wendt. Sadly that project will now become a tribute to his memory instead. My condolences to his daughters and to all who came to know the Pad Leader. Miranda came and told me of his passing. We met him for the first time at the San Antonio autograph show and we saw him at least 3 times after that. He spoke to the group of Future Astronaut Training Program students from the Cosmosphere when they visited the Cape last year. He was a grand gentleman and he will be missed. 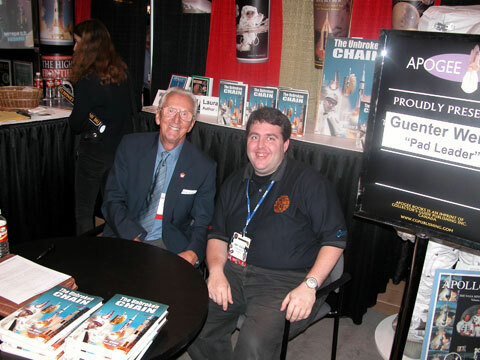 It was a privilege to meet him at the autograph show in DC, Memorial Day weekend 2003. He was an historic figure. I am so sorry to hear the news. Three years to the day after losing Wally. Two of the nicest guys you'd ever want to meet. Has the family said anything about where to send donations? I must have a manhattan later in his honor. It was an incredible privilege both knowing and working with the man. I always made a bee line to him to say 'Hello' if I knew he was there. I was lucky to have met him and have had an opportunity to interact with him on several occasions. He will be missed. A great man. With each passing of a space giant, our country dies a little. He lived a long and good life. For all his reputation as a strict taskmaster at work, he had a great sense of humor and was friendly and approachable. I'll never forget asking for his autograph at the San Antonio UACC show and then being invited to sit down with him, as he told stories in his German accent for 15 minutes or more. For example, he said after he retired he had been asked to return to the "White Room" but he declined because he himself was not able to fulfill the physical requirements he set for pad workers. I can just see Guenter and Wally in heaven playing gotcha jokes on each other. Godspeed! It was an honor to have met him once. We owe so much to his endless safety efforts and commitment to perfection.